You know this new set (You’ve Got This) is just such a cool set! It’s so easy to make classy cards without too much work. I also REALLY like the new Tip Top Taupe color. Just such a pretty neutral color. This was one of the cards we did in my card class in June. I think everyone like it and liked how easy it was to do. Tip Top Taupe – 3 3/8 x 4 5/8, round bottom right corner, run through the Boho Chic Embossing Folder, then layer onto Whisper White 3 1/2 x 4 3/4 with bottom right corner rounded. Add to card front. Whisper White – 4 1/2 x 2, punch top with the Ornate Tag Topper and round the bottom corners. 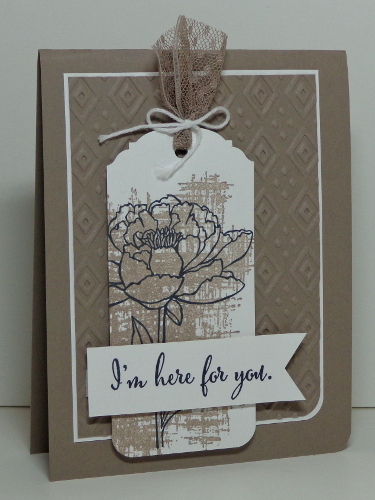 Stamp background using Tip Top Taupe (stamped off once) and flower using Memento Black. Add Tip Top Taupe 1″ Lacy Ribbon through hole on top and tie using Whisper White Baker’s Twine. Add tag to card front using dimensionals. Whisper White – 7/8 x 3, stamp greeting using Memento Black, cut into a banner and add to card front using dimensionals. And let me tell you…these projects are just WONDERFUL!!! 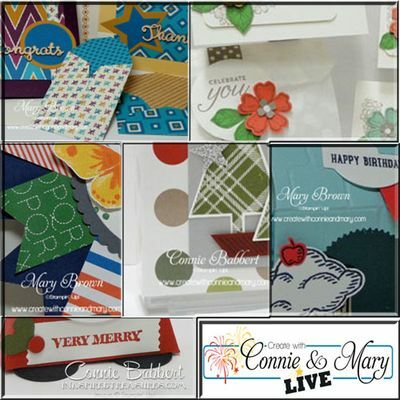 So head on over to Create with Connie and Mary to find out more! And we have the option to pay using PayPal! This entry was posted in Create with Connie and Mary and tagged You've Got This. Bookmark the permalink. Love this, Mary. TFS. I’m going to make a few and CASE for a stamp camp, too – perfect for a sympathy card, I think, and something we always seem to need on short notice. I will give you full credit.